To make the pastry, combine the flour and sugar in a bowl. In another bowl, cream the butter and gradually mix in the egg, yolk, chilli and flour mixture. Work until you have a smooth dough. Wrap in plastic and refrigerate for 1 hour. On a lightly floured surface, roll out the dough to fit a 22cm tart tin. Prick the base all over with a fork and bake blind for 15 minutes. Remove the beans and bake for a further 5 minutes. Remove from the oven and allow to cool in the tin. For the filling, pour the cream and Grand Marnier into a saucepan. Bring to the boil over medium heat, then remove and set aside. Put the chocolate and butter in a heatproof bowl and strain in the hot cream mixture. Stir until smooth and well combined. Place the cooled pastry case on a serving dish. Pour in the filling and leave to cool completely in the fridge. 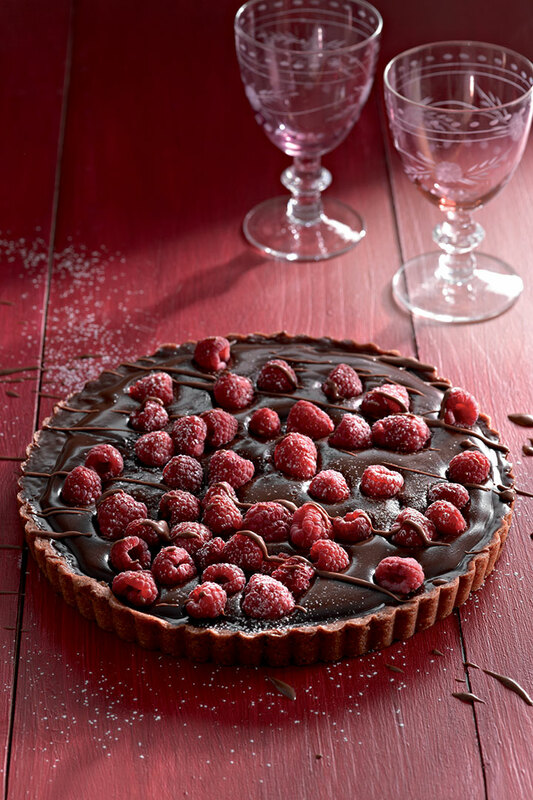 To serve, arrange the raspberries on top of the tart and slice.